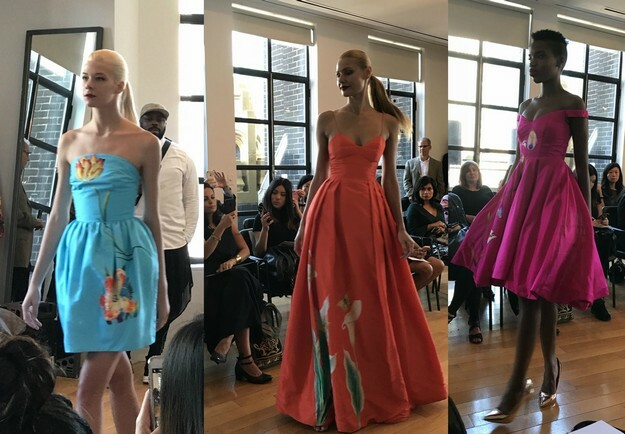 Fashion designer Nany Tran premiered a brand new collection at the Bryant Park Hotel in Midtown. Formerly a lawyer, Tran follows her passion for design and this marks as her first NYFW show. Inspired by the themes of rebirth, the collection touches on the idea of metamorphosis, with not so subtle images of butterflies and flowers, literally. “The brand was created for all women – whether they’re avid fashionistas, corporate executives, bon vivants, or homemakers – as an expression of elegant glamour,” says Tran. Standouts included a hot pink cocktail dress and a stunning orange full length gown. Overall the collection is quite beautiful and there’s a timeless quality to the garments. However, the butterfly motifs on nearly every garment took the inspiration to a very literal and repetitive place. “When a woman wears Nancy Tran, I want her to feel as sensational as she looks, to unleash her own potentials, whether it’s the resolve to become her best possible self, the confidence to command attention, or the delight in celebrating a moment of being beautiful,” adds Tran. Read more on our show from The Queen of Style.